One of the storylines int his one was an experienced Drew Brees under center for the New Orleans Saints, and a young Jared Goff in the same spot for the Los Angeles Rams. Brees had enjoyed another great year even though he just had under 4,000 yards passing. Goff was at the helm of one of the best offenses in the NFL and finished with over 4,600 yards passing. Of course, each team had a running game to compliment the passing game. For the Saints, it was the best one-two backfield punch in Mark Ingram and Alvin Kamara. For the Rams, it was the NFL’s second-leading rusher in Todd Gurley. The crazy part of this game is neither running game would play much of a factor in the end. Before the game, the crowd outside of the Superdome was huge and loud. Saints fans were pumped up as they had been preparing for this all season long. A trip to Super Bowl LIII was not expected, it was mandatory. As we filed into the stadium, you could feel the electricity in the air. You could feel the confidence in each and everyone around you. It would carry over to the team as they took the opening kickoff and take 11 plays and 56 yards capped off by a Wil Lutz 37-yard field goal to make it 3-0. A key play in the drive was on third and three from the Saints 43. Brees dropped a short pass to Kamara and he did what he has done all year. He took a short gain and turned it into a 21-yard gain before going out of bounds. On their first possession, the Rams looked to get on track quickly. That was very short-lived when on third and seven from their own 13, a Goff pass intended for Gurley was picked off by Demario Davis. It gave the ball to the Saints at the Rams 16 and five plays later, Lutz made it 6-0. At this point, the crowd was in a frenzy and the fans could smell blood. Yes, it was only 6-0, but momentum looked to be in favor of their team at the time. The volume would only get turned up when the Rams went three and out on their next possession. So what did the Saints do in return? They drove 68 yards on eight plays ending on a five-yard touchdown pass from Brees to Garrett Griffin. Now, if you have been paying attention to the NFL regular season, you would know not to count out the Rams and their potent offense. But, they would need to respond at this moment, their biggest test to date in this season. Finally, the Rams would put together a drive that would eat up 6:50 and resulted in a Greg Zuerlein 36-yard field goal to cut the lead to 13-3. The big play to keep the drive alive was a fourth and five from the Rams 30. Head coach Sean McVay took one heck of a chance on his side of the field. The Rams lined up for the punt, but punter Johnny Hecker completed a short pass to Sam Shields that went 12 yards and kept the drive going. The teams would then trade a few punts and the Rams got the ball with 1:50 to go in the half. An impressive drive ended up with a Gurley touchdown of six yards and just like that, we had a football game. The Saints would kneel out to end the half with a slim 13-10 lead. As I mentioned at the beginning of this piece, the Rams have one of the best offenses in the lead. Therefore, no lead is ever safe, not even when you go up 13-0 at home in the conference championship game. It would be up to the Saints defense to see if they could accomplish that feat. The second half would see the Rams get the ball back, but they could not move and went three and out. On the next two possessions, each team would put the ball in the end zone and the offenses appeared to wake up. The Saints got in first when they Brees and Kamara took them down the field on 12 plays. The drive ended with a Brees to Taysom Hill two-yard pass to make it 20-10. Goff and the Rams would have an almost identical drive that ended in a Goff to Tyler Higbee one-yard score to make it 20-17. The excitement in the building was still there, but you could feel the fans getting a bit nervous as the Rams were looking more like the regular season version of themselves. Several more punts from both teams and we were now in the fourth quarter. Time for one of these teams to step up in the championship moments and make their way to the Super Bowl. The Rams would tie the game on a Zuerlein 24-yard field goal with 5:03 left and at times you would swear you could hear a pin drop. I, myself am a Saints fan, and my heart was in my throat with every play from this point on. The next two drives for each team resulted in a field goal and the NFC Championship game was going into overtime in New Orleans tied at 23. A huge 48-yard field goal by Zuerlein ensured that and now it was up to the coin toss to see who got the ball first. But none of this would be necessary if not for one of the worst non-calls in the annals of NFL football. Instead of just running the ball and killing the clock, Saints head coach, Sean Payton made a risky call. Brees dropped back and threw down the right side to Tommylee Lewis. Covering him was CB Nickell Robey-Coleman. He decided to play the man instead of the ball and before the ball got there, he would hit Lewis helmet to helmet for a sure pass interference call that would have given the Saints the ball inside the five. Instead, the refs missed the call, a call that was obvious to the naked on the field eye, and it gave the Rams and Zuerlein the chance they took advantage of. 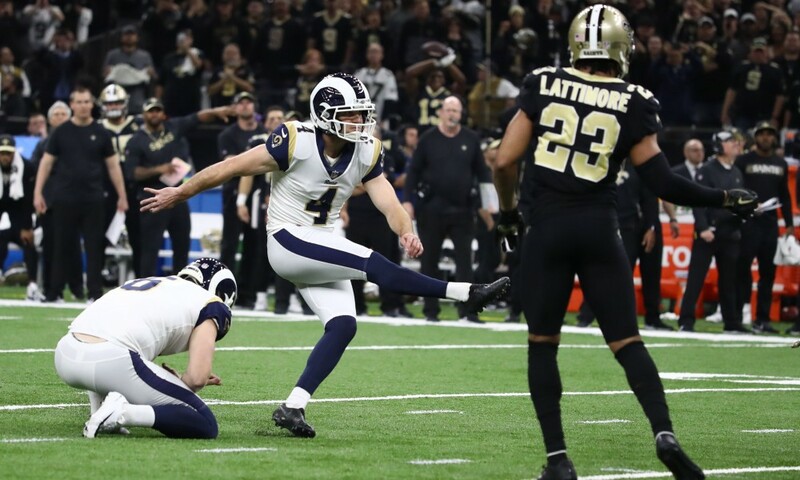 Zuerlein would kick a booming 57-yard field goal in the OT to send the Rams to Super Bowl LIII. The team that should be going to Atlanta would be staying home on a game decided by the refs and not the play on the field. The argument of officiating was now revved up to a new decibel. The fans, players, and coaches would have fodder to feed themselves a reason why officiating must be held accountable. After the game, Payton would say that he received an apology from the NFL. That has not been made official as the NFL is a reactive league, not a proactive league. Nothing against the Rams, they did, after all, come back from 13-0 and 20-10 to make it a game. Still, it just does not feel right and for Saints fans like myself, the ride home was long and felt dirty. You can take it if your team loses the game, especially the NFC title game. But it is hard to swallow when the refs take away a game that was already yours.